After spending the last four years trapped in a place of monsters, demons, and magick, the last thing the fierce teenage bounty hunter Greta expected was to ever be back on Earth. But a rare opportunity gives her and the Goblin King Isaac the opportunity to do just that. Now she’s home. With a boy in tow. And her parents have lots of questions. 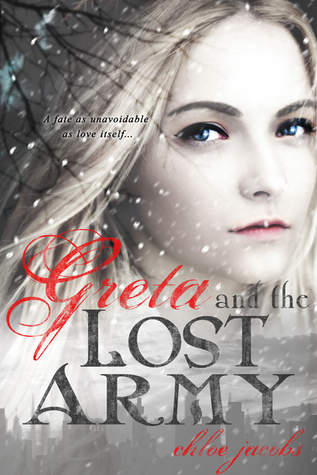 But a powerful enemy refuses to let Greta escape. A demon who will stop at nothing to destroy her and everything she loves. Even if it means following her to Earth and forcing her to face a fate as unavoidable as love itself. I couldn't wait to read Greta and the Lost Army. I had been missing my Goblin family of Mylena. Most of all of course Isaac. One of the things that I had like so much about the first book was that Greta and Isaac relationship was already established. This made the the prologue of the Lost Army even sweeter as it’s a flashback to Greta and Isaac actual first meeting. I couldn’t help but smile while reading it. You know how far they have come but this is where it began. Such a great touch. We start where we left off and that’s Greta, Isaac, the boys and Siona find themselves in the human world. Obviously there isn’t fighting, the same way there is when they are Mylena. I liked that Greta’s parents didn’t become just background noise of a life she once knew. We are actually able to find some closure and she also has options. The boys are able to find their families and reconnect. I loved that this was worked into the story. It might have not been the most action filled part of the book but it was definitely important. Greta of course is still the first heroine we know her as. She’s learned to fight so much on her own that she has to learn to trust Isaac as her companion. She loves him of course but she has this independence that can almost be too much at time. We really see her grow into her role. Oh Isaac. I love him no matter what he does. He is such a great support system for Greta and such a strong king. Swoon. I love Greta and Siona’s friendship. They have to work through some issues with book two. Well a really big issue but I love how they are the friends that last. They could probably not talk for a while and still be there for each other instantly. It’s always great to see a bond like this, especially one that has importance. I was excited to read this final installment but also sad to say goodbye. Maybe there can be some spin-off stories. Maybe even short ones, maybe a Siona one. You know just suggesting. the world is dark and vivid, the pacing well done and I enjoy Chloe Jacobs writing. I really recommend this series, especially if you love swoony Goblin Kings, strong heroines and adventure.